Uncommon in California, mostly occurring in Modoc, Lassen, Mono, and Inyo cos. Isolated populations occur in Tehama, Monterey, San Luis Obispo, Riverside, and San Diego cos. Found in open stages of a variety of habitats, particularly those of the Great Basin. Perennial grasslands, wet meadows, pastures, pinyon-juniper, Joshua tree, and desert scrub are preferred habitats in the Owens Valley. Riparian habitats are used, as well as open stages of other hardwood and hardwood-conifer areas. Sagebrush habitats also used. Feeding: Horses primarily are grazers, but also feed on browse. Where grass is less available, forbs and browse are more important. A wide variety of plant species used. Most studies (National Academy of Sciences 1982) show that 80-90% of the diet is grasses. Feed primarily in open, grassy areas. Use mineral licks and occasionally consume soil, probably to correct sodium deficiency in the diet (Salter and Pluth 1980). Cover: Use open areas in which predators can be seen from a distance; seek cover and shade in thickets of riparian habitats and dense brush. Reproduction: Use open, grassy areas. Water: Bands visit water holes daily. During hot weather, they may water more frequently (Slade and Godfrey 1982). May dig up to 1 m (3 ft) to subsurface water. Pattern: Found primarily in open, grassy areas. In winter, spend more time on ridges, in summer, more time in lowlands where water is present. Available shade is important during summer. Horses tend to avoid steep slopes. Usually occur within 6-8 km (3.6-4.8 mi) of water. Activity Patterns: Active yearlong; primarily diurnal. Home Range: Tend to form stable bands that do not defend a territory (Feist 1971, Feist and McCullough 1976, Nelson 1980). Bands usually consist of 4-6 females and 1 or 2 stallions. Home ranges of bands overlap only in areas of well-travelled routes. Lone horses usually are stallions past their prime, inhabiting areas between the ranges of adjacent bands. Home ranges seldom are over 40 km² (14.4 mi²) (Slade and Godfrey 1982). Territory: Dominant males control a harem. There is a dominance hierarchy among the females of the harem. Reproduction: The harem is the breeding unit in the polygynous mating system. Copulation may be year-round, but the peak mating period coincides with the foaling period of April-May (Nelson 1980). Gestation is about 340 days. There is generally 1 precocial young; twins are rare. Often, a female produces young in alternate yr. Males are forcibly ejected from the group at 1-3 yr of age. Females do not enter estrus until their third, sometimes second yr, at which time they are captured by the dominant male of a harem. First year mortality may be as high as 40-50% in some areas. Horse herds on good range generally have a reproductive rate of up to 40 foals per 100 mares, and as low as 20 foals per 100 mares on poor range (Slade and Godfrey 1982). Niche: Compete with native mountain sheep, pronghorns, and with livestock. Sources of water ofter the focus of competition in arid ranges, and horses compete for forage in all ranges. The mountain lion is probably the only potential predator of the horse, although coyotes and bobcats occasionally may prey on colts. All wild horses in California are feral; they originated from domestic stock. Feist, J. D. 1971. Behavior of feral horses in the Pryor Mountains Wild Horse Range. M.S. Thesis, Univ. Michigan, Ann Arbor. 129pp. Feist, J. D., and D. R. McCullough. 1975. Reproduction in feral horses. J. Reprod. and Fertil., Supplement 23:13-18. Feist, J. D., and D. R. McCullough. 1976. 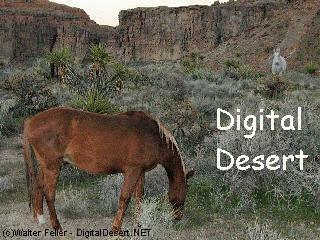 Behavior patterns and communications in feral horses. Z. Tierpsychol. 41:337-371. National Academy of Sciences. 1982. Wild and free-roaming horses and burros. Final Rep. National Academy Press, Washington, DC. 80pp. Nelson, K. J. 1980. Sterilization of dominant males will not limit feral horse populations. USDA, For. Serv., Rocky Mt. For. and Range Exp. Sta. Res. Pap. RM-226. 7pp. Pelligrini, S. W. 1971. Home range, territoriality and movement patterns of wild horses in the Wassuk Range of western Nevada. M. S. Thesis, Univ. Nevada, Reno. 39pp. Salter, R. E., and D. J. Pluth. 1980. Determinants of mineral lick utilization by feral horses. Northwest Sci. 54:109-118. Slade, L. M., and E. B. Godfrey. 1982. Wild horses. Pages 1089-1098 in J. A. Chapman and G. A. Feldhamer, eds. Wild mammals of North America. Johns Hopkins Univ. Press, Baltimore, MD. 1147pp. The Mustang, originated in north America, migrated across the Bering Strait to Asia, and dissappeared completely on the continent about 10,000 years ago. In the 1500's, the horse was reintroduced by the Spanish. Horses escaping captivity flourished in their once home environment. Wild Mustangs today are generally captured, then adopted out or otherwise disposed of. Successful wildlife viewing requires a few simple tricks. Click here to find out what they are. Everything has its niche. Who eats what, and what eats who in the desert? Click here to find out what more.